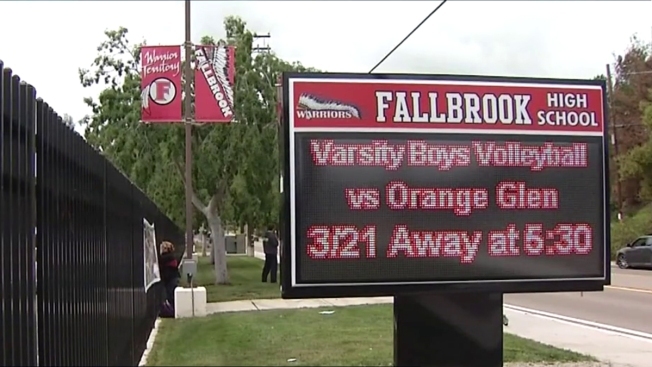 A water main break forced administrators to cancel classes at a Fallbrook High School Thursday when the campus was left without water service. A notification from the school was posted at about 7:30 a.m. alerting parents and students that classes would be canceled for the day due to the main break. "Unfortunately, there has been a water line break in the area and we will not have access to water for most of the day. Therefore, we have to cancel school for today," the school wrote in a post on Facebook. Water began flowing from eroded pipe sometime overnight in the area near Mission Road and Stage Coach Lane, according to Fallbrook Public Utility District manager Jason Cavender. Crews closed down the roadway and shut off water service so they could get to the pipe and determine the cause. They determined break was caused due to an old crack that eroded over time, possibly the last 20 years. "Someone hit it at some point," Cavender said. "It could have been 20 years ago when Mission Road was widened." The dent left behind turned into a three- to four-inch hole in the pipe that sent water flowing through the streets on Thursday. Water service was expected to be restored to the school and all others affected by 3 p.m., Cavender said.